"This Might Be the Day" Is the Legitimate Solo Album, Not "Pimp Tight"; "This Might Be the Day" Is MJG's First Full Length Studio Album in Over 10 Years and Features the Hit Single, "Shades"
ATLANTA, GA--(Marketwire - May 20, 2008) - 404 Music, Inc., together with MJG Muzik and Push Management, are setting the record straight with respect to the new studio album from Memphis rapper, MJG. 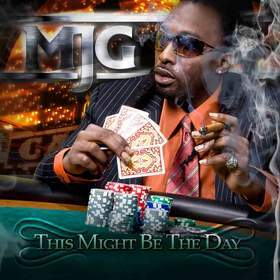 MJG's upcoming album, "This Might Be the Day," features twelve new tracks, including the hit single, "Shades." "This Might Be the Day" is being released by 404 Music, Inc. in collaboration with MJG Muzik and Push Management. In response to the controversy and confusion regarding the mixtape entitled, "Pimp Tight," Nina K. Easton, president/CEO of 404 Music, Inc., states, "I want to stress that 404 Music has absolutely no affiliation with the mixtape, 'Pimp Tight.' Anyone who knows me also knows of the values and the causes that I have promoted and supported through the years. Releasing questionable product is not one of them." "404 Music has been receiving non-stop inquiries from various retailers and members of the music industry about MJG's new album, 'This Might Be the Day.' We have been telling them that the album will be available on July 1st," adds Easton. "We appreciate the great interest in MJG's new record." 8Ball, Gucci Mane, and Pleasure P (from Pretty Ricky) are featured on "This Might Be the Day." About 404 Music, Inc.: 404 Music, Inc. is an Atlanta based record label that focuses on Urban, R&B, and Rap music. Established in 1998 by Nina K. Easton, some of 404 Music's key releases include Popa Wu's (Wu-Tang Clan) album (produced by RZA) and Young Jeezy's first album. For more information, go to www.mjgmuzik.com and www.404music.net.